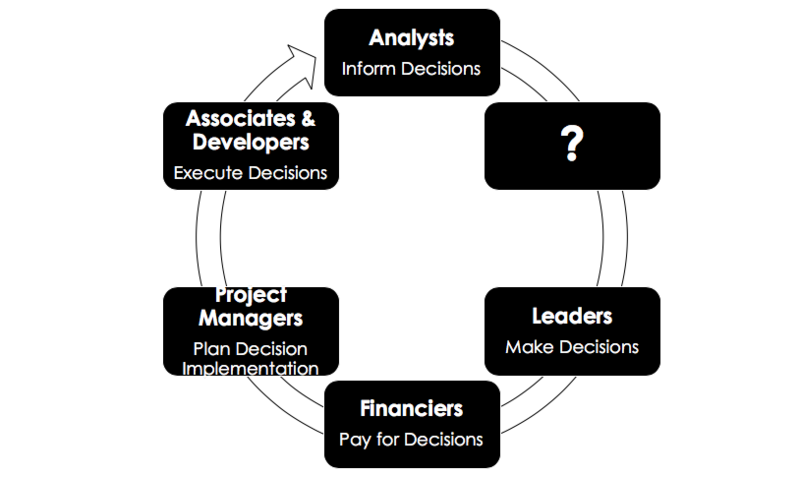 In any strategic planning or decision-making meeting, there is usually a specific mix of stakeholders present, including Analysts (informs decisions), Leaders (make decisions), Financiers (pays for decisions), Project Managers (plans decisions), and Associates/Engineers/Programmers (executes decisions). However, there is usually one important component missing from these meetings: the Management Consultant (challenger/arbiter of decisions). In the article “Everything You Need to Know About Management Consulting,” I discussed several reasons why people hire consultants. There is another specific reason people hire consultants that merited its own separate article, and that is for their value as an “outsider.” While consultants are often hired for their sector or industry experience, they are also often hired to provide innovative ideas from an outsider’s perspective and improve productivity through moderation at any level of an organization where strategic decisions are made. In other words, consultants are sometimes hired to play the Devil’s Advocate. What do I mean by Devil’s Advocate? A Devil’s Advocate is someone who takes a different position from the accepted norm for the sake of debate or for further discussion. Now I’m not saying you need to ask, recruit, let alone pay some smartass to sit in on your strategic planning meetings and critique everything people say and every decision they make purely for the sake of doing so. That wouldn’t make much sense. Rather, if you are in a decision making position, I suggest you first do an assessment of your team meetings centered around making decisions. The chances are your team meetings will lean more into one of two categories: either most of your team disagrees and nothing gets accomplished, which I will refer to “chaos”, or most of your team agrees, which is referred to as “groupthink.” Regardless of which category your team leans toward, Management Consultants can play a vital role when strategically planning or making decisions. Let’s start with Groupthink. Arguably one of the best leaders that ever lived, General George Patton, once said, “If everyone is thinking alike, someone isn’t thinking.” This statement summarizes Groupthink perfectly. When everyone is thinking alike and you’re “all on the same page,” it can be cancerous to an organization. It can mean many things, but more likely that no one is paying attention, no one cares, or worst of all, people are too afraid to speak up. If the status quo or any decision for that matter is not being challenged, innovation has effectively been stymied. In any organization, diversity of thought and experience, not physical diversity, are critical components of any successful team. In fact, if your board members, mentors, or teammates all come from the same background/industry and are rarely challenging your decisions and assumptions, that’s a serious problem of Groupthink. Groupthink leaves ideas or decisions unchallenged and serious mistakes can be made as a result. Because you’re human, otherwise wouldn’t be reading this, you will eventually make bad business decisions based on faulty assumptions or data. So, it behooves you to have an outsider without any preconceived biases, to challenge your logic before those bad decisions are made. The truth is that if a decision or position cant be defended with a logical argument based on factual data, information, or evidence, someone is relying on instinct and that can be a precursor to a major failure. As the Devil’s Advocate, a Management Consultant can add value to strategic planning meetings by challenging assumptions, bringing fresh ideas as an innovation facilitator, and providing critical information necessary for making major decisions. This will help avoid or minimize the effects of future failures caused by Groupthink in these circumstances. For the Chaos category, as the name suggests most meetings are chaotic because there are just too many disagreements, arguments, or side discussions occurring. The negative implications of this type of environment are self-evident, the chaos kills productivity. I’m willing to bet that most readers are on a team that falls into this category. These same readers are likely asking why they need one more addition to already chaotic meetings. The reason is simple. As a third party, the Management Consultant can also function effectively as a moderator or arbiter. In fact, a major part of a consultant’s job on strategic planning engagements is to moderate discussions, encourage brainstorming, and instill civil debate among team members. As a moderator, consultants don’t and shouldn’t have any loyalty to any one side of the debate. Their interest as the middleman is in helping the company improve productivity, which may include solving a problem or assistance with making a decision. Making this known before the debates/discussions begin, consultants can keep meetings more focused, encourage the continuation of original ideas, and challenge speakers to explain and defend their arguments. For example, a team member normally intimidated to speak up in meetings could be encouraged by a consultant to elaborate on a thought that might prove to be critical for success, or someone who takes up too much “air time” with needless rambling could be reigned in. We all know that person. Having a consultant present in both of these instances can dramatically increase productivity by playing the necessary part that no employee wants to play, lest they risk losing their job. Put another way, if all stakeholders are in disagreement during the strategic planning phase, the disagreements will only get worse and diminish productivity when it is time to implement the plan. In these instances, Management Consultants can moderate effectively, provoke brainstorming, and promote a larger stakeholder buy-in to increase the chances of success on strategic engagements. In summary, when it comes time to make important decisions or plan strategically, whether you need someone to challenge your company’s groupthink, or control the chaos through moderation and gaining stakeholder buy-in, Management Consultants are a worthwhile consideration. Though I have moderated several hour long decision-making meetings, I wouldn’t say it is necessary for most circumstances where a high level of risk is not present, such as weekly status meetings. However, if you’re embarking on a major strategic planning initiative that involves a substantial amount of risk based on many assumptions, involving a Consultant at the earliest stages and throughout the engagement could increase the productivity and identify inventive ideas that otherwise would have been missed. Doing so could thereby improve the project’s chances of success overall.